Many times the human eye sees things much better than what a camera can see. The eye has a much larger contrast ratio with a lot more dynamic range. Other times the camera comes out on top and can see things that our eyes can not. This is one of those photos. Looking at this photo, one can see all of the detail in this landscape at Zion National Park in Utah. When I was photographing it, however, it was much, much darker than this. The sun had set behind me almost 30 minutes prior to me taking this photograph. A nearly full moon had come up over the horizon in front providing some illumination. The rest of the illumination in this photo came from the light still present in the sky behind me after the sun had set. A long exposure and higher ISO – 15 seconds at ISO 400 – was used to provide me with a photo that I couldn’t quite see with my own eyes but what the camera had no problems in helping me see. 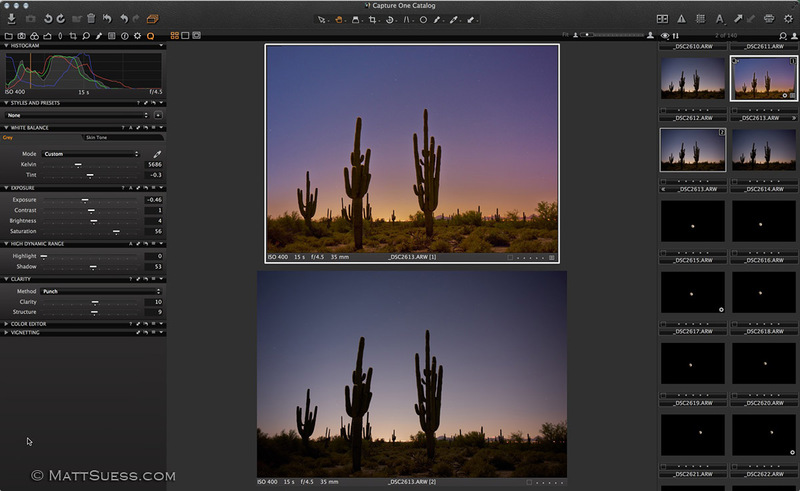 In part 2 you can read how I enhanced and built the composite photo using Capture One Pro and Perfect Photo Suite 8. Read it here. Overnight on April 14 through early morning April 15th we were treated to a wonderful total eclipse of the moon that at it’s peak turned the moon a blood red color. The eclipse was visible to most of North and South America – at least visible to those of us who had clear skies that night. Purchase prints of this photo right now during a special limited time promotion. The event is rare, with the most recent total lunar eclipse happening on December 21, 2010. However we are in for a treat as we will have 3 more total eclipses in North America within the next 1.5 years: October 8 of 2014, April 5 of 2015, and September 28 of 2015. After that we will have to wait another 3 years before another one happens. I knew of the April 15th eclipse a few weeks prior to it happening, which gave me plenty of time to prepare. I was still going to be in Phoenix which was great as the weather is usually perfect and rarely cloudy & rainy. So I started planning my final image and what I needed to do to create it. Right off the bat I knew I was going to somehow incorporate saguaro cacti in my photograph, as they are a unique feature here in the Sonoran Desert. I have been spending numerous evenings photographing sunsets this winter out in the desert where my RV is parked here in North Scottsdale and knew the location would be perfect for the eclipse.